The reservation was made before Swiss had even taken delivery of their first Boeing 777. A seat map wasn't available. I thought it was an error but decided to book it anyway just in case. Eleven flights on this journey and It was the only one I didn't change or adjust at some point leading up to departure. The quest to fly the best of Star Alliance just hit a homerun. Out of the 6 different carriers on this journey, ANA,Thai, Singapore, Air New Zealand, Swiss and SAS, I was most excited to fly the new highly vaunted Swiss 777-300ER. I want to fly Air New Zealand 787 again, Thai 747 again and SAS again. They were great all around flights from aircraft to seating to food and amenities. This one wasn't bad, just not memorable. Arriving at BKK for a 1PM departure found a busy place. The Swiss counter had plenty of agents available considering it's their only flight out of BKK. Checking in on the Swiss mobile app was easy. All that I needed to do was drop off my bag, as I didn't want to have an issue on the A320 flight with its small overhead bin and a fat carry-on as well as a second piece duffle bag. So I had it wrapped for an outrageous amount of $10. Swiss also provided a priority pass for security, who promptly confiscated 1 ounce of liquid because it was in a 4 oz container. 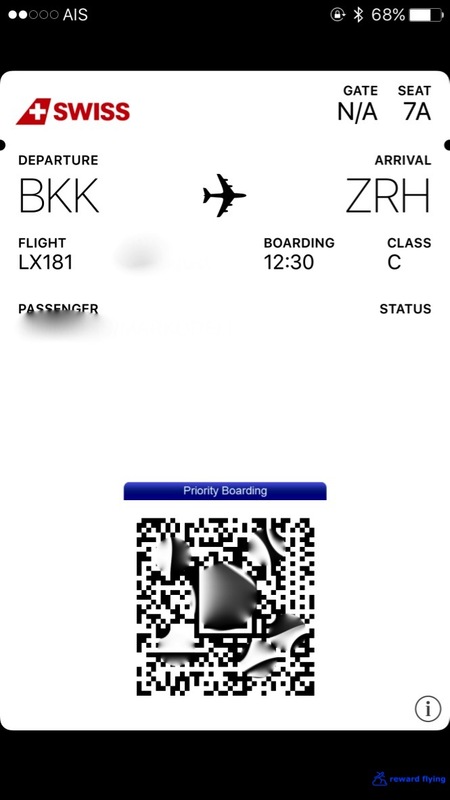 Swiss doesn't release a ton of reward space, although the BKK-ZRH route seems to open often. From North America currently they fly the 777 from Montreal and are supposed to start from San Francisco soon. Interestingly it cost me 80,000 UA points to go from SIN-BKK-ZRH-ARN-ORD. To go from BKK-ZRH, or even SIN-BKK-ZRH-ARN is 85,000 points. Reward chart sweet spots are good! Shortly after ticketing this reward Swiss released a seating chart. I jumped on it knowing the throne seats are the best and found the mini-cabin 4A to be perfect. A few months later I noticed my seat had changed. They moved me to 4K on the other side, not the single throne seat. 4A was still open but I couldn't select it. So I called. Reserved for Miles and More Premium Members. But I'm Star Alliance Gold. Reserved for Miles and More Premium Members. I took 7A. After doing some shopping in the terminal I headed for the lounge. It was next to my gate. LX181 was sitting outside the window. Today was also the day Thai was receiving its first A350. (The one I was supposed to fly last week.) 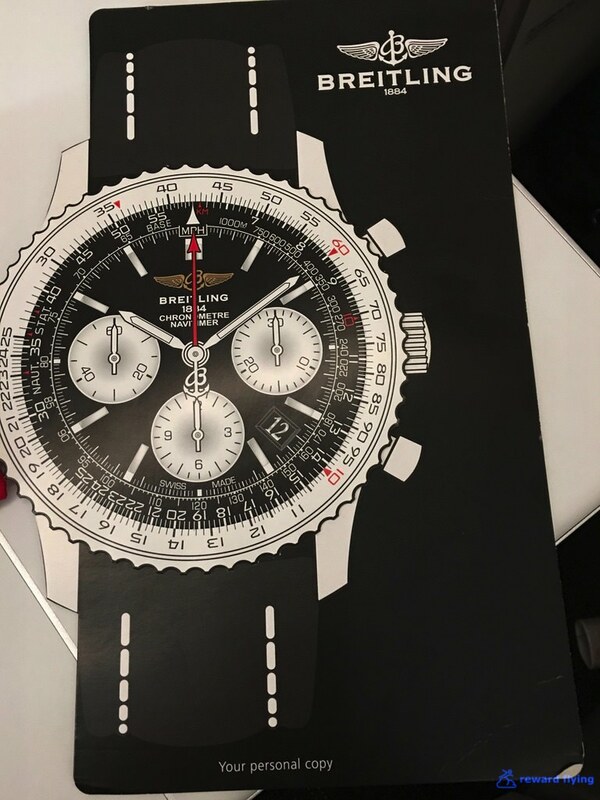 I knew it had arrived, but I was still keen on spotting it. With an obstructed view from the lounge and from a distance every A330 was it! Even that one up there above Swiss. Oh well. Let's find some of those Young Coconut Jelly things they had in Singapore. Fried things, yum but no. Ahha. What are these little colored circles. Coconut pudding. Yes! I didn't eat them all. Next I passed some time looking around this attractive lounge. The boarding area was a zoo. Thankfully boarding commenced on time. The flight's purser greeted everyone and was genuinely nice. A hint of things to come was the first flight attendant I encountered once onboard. He was a younger male in his late 20's, early 30's I'd guess and he stood at row 8. He'd say hello if you said it first. I watched him. He never moved, never helped anyone with their luggage. Just watched people lug their stuff past him. After much of the cabin was full he was gone. The female attendants on the other side and in the back of the business cabin were the opposite. Helping and speaking with everyone. The cabin doesn't do the Swiss promotional pictures justice. Which shouldn't be surprising. It's one tone and bland. It's also packed with seats. A peak up front at the mini-cabin to spy on that Miles and More Elitist sitting in my 4A seat. I'd be tempted to opt for the mini cabin next time, although seat 7A has its advantages. Amenity items in the lavatory. Good thing it was a smooth flight. Now that Thompson Aerospace has the Vantage XL, I'm surprised Swiss chose the older Vantage style for their new flagship aircraft. The differences are huge, and in the XL's favor. Obviously economics was the deciding factor, 5 business class seats per row versus 4 and of course Swiss went the deplorable 10 wide in economy. Anyway I don't own the airline so it's not my choice. Nicely designed compartment holding the headphones and a bottle of water. If you have a coat you can keep your boarding pass with Swiss! Rows are offset for privacy. Bulkhead seats have 4-5 inches more legroom and a wider footwell. These seating pods have more storage than any others I've seen. The question becomes, for what? 1. A huge pull out compartment. My kitchen would like this. 2. On the other side a magazine rack I guess. 3. This little compartment stored the my phone. But the power is on the other side. 4. Down below, shoes? Sure why not. Then on the bulkhead or seatback under the monitor. Perfect for the tray but no. An interesting little compartment next to the footwell. Could hold a briefcase or small shoulder bag. However I only think this compartment is on the bulkhead throne seats. Albeit a little awkward to pull out from the side cabinet. The footwell seemed a bit wider than on Austrian. But this may have been the bulkhead. Seat controls on the armrest that control the seat unwantedly when your arm is resting. But not as bad as prior versions of this seat. Or pop up the lid and find more options and the audio controller. Being a day flight I did not sleep. However I did extend the bed and unfortunately it has the same hump in the middle of your back. I would not use it fully flat. The seat itself is comfortable, but fairly narrow at 20.5 inches. It seems like you have more room for your feet than your shoulders. 7A is a good seat with the only downside after lunch the line forming for the lav was disruptive if you intended on sleeping. A small pillow without any bulk, blanket, nice quality headphones and amenity kit were placed in each pod. The amenity bag is reusable and they have different ones hoping you collect them all. I didn't want this one. The amenity kit contents. Mouthwash was not on the aircraft. Nor were slippers. Champagne and Wine on today's flight. And my predictable choice, I'll stick with France. The Taste of Switzerland, Chef Fiorian Trento from Peninsula Hong Kong. I was going all the way with Chef Fiorian's dishes. Service began a good 45 minutes after departure. It was disorganized from the beginning. Nothing in particular stood out with this appetizer other than the crust on the bread would have broke someone's dentures. Fortunately they provided eye masks in the amenity kit. Often I'm too full for cheese after a meal. Not today. That bread again. The walnut was good. And not even dessert could save this disaster. Can't decide if the cake was stale or had just been frozen three too many times. Landing couldn't come soon enough. Another food service! They did pass around a box a chocolates and you got to pick a piece. Went so fast I couldn't get a photo. A salad should be good. So this whirlwind trip had about 15 on board meals. You are looking at the worst one. The pictures don't do it justice. There is no dressing on the salad. In the cup is a thick mustard sauce that was nice for salmon but not so on lettuce, in my taste opinion. If this tail end piece of salmon weighed more than one ounce I was the pilot of the plane. Then I get to the Hilton in Zurich and stumbled upon a $35 hamburger. Tomorrow's another day, and besides I've eaten quite well on this trip. A nice monitor. But not the same quality as on Austrian or SAS. An interesting air show that shows pitch and roll. Glad it remained stable. Numerous options for air show view. Why are James Bond movies so popular on Lufthansa Group flights? Austrian had Bond. This flight was over the top. There were 95 movies available. 24 were James Bond. They've made 26. I must have miscounted. Except I didn't see any instructions on how to connect, nor did I try so maybe it didn't have WiFi. Service was disorganized. It took over 2 hours to complete lunch. The flight attendant who took care of my area was best described as indifferent. The purser was great. I chatted with him and he was super nice and truly enjoyed his job and dealing with people. . The other crew members looked efficient as well. I just happened to get the one that drives the rating down. And they need to get their service orientated. This was a 4 month old plane. Here's the first 777 delivery at Zurich International. Terrible flight, no. Disappointing yes. The airplane is great. The seat is good. The food was bad, really bad for an 11 hour business class flight on an airline trying to reinvent their premium service. The IFE was good, especially if you like Bond, but had some other good selections as well. Would I fly Swiss over the other 5 carriers on this trip next time, no. 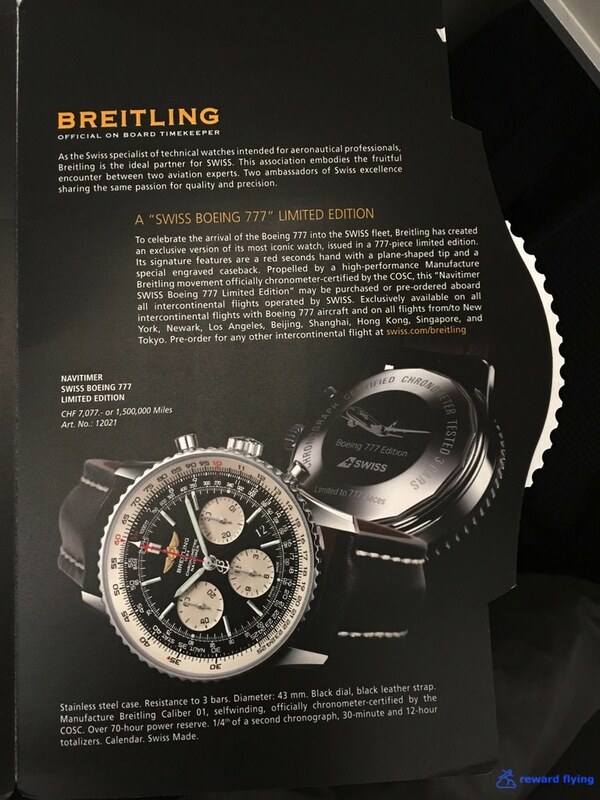 If you are so inclined, the Breitling Swiss 777 watch is available only when flying the 777. The on-board brochure. For a mere, wait for it, 7,077 Swiss Francs you can wear one home. I didn't. 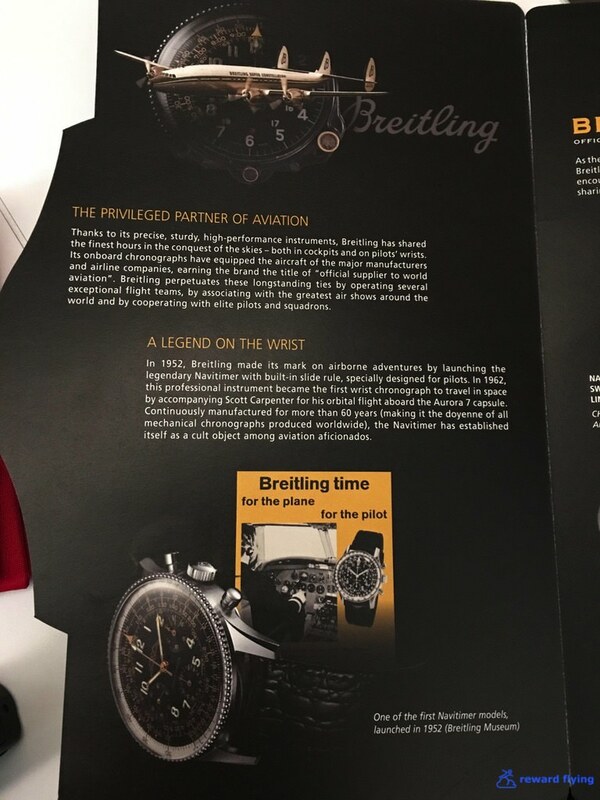 On display at the Zurich airport.